You must make reservations at least 5 minutes in advance of the time at mBar. Paid parking garage located in the 400 Fairview Building, $5.00 after 4pm and all-day on weekends! Semi-private lounge available for up to 20 people. We also offer partial patio buyouts for groups of 20 - 45 guests. 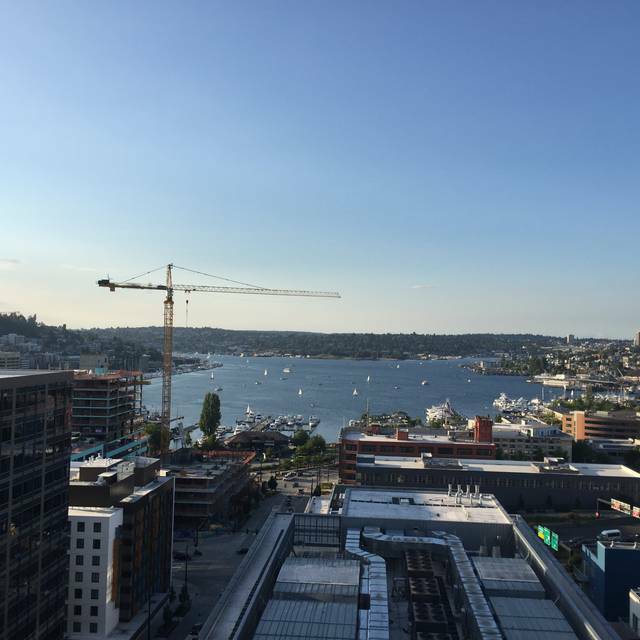 mbar is a modern restaurant and bar with stunning views of South Lake Union and the Seattle skyline. We are proud to feature a dynamic contemporary art collection, cuisine showcasing the exceptional talent of Chef Jason Stratton paired with kind and warm service. For parties of 8 or more, please call 206.457.8287 or email tim@mbarseattle.com to inquire about availability. For our full dinner menu, please choose "standard" for reservations in our beautiful dining room, or "bar" for the bar located inside the dining room with side by side seating. For all patio seating, please select "outdoor seating." Please note that booking an standard or bar reservation will not automatically guarantee seating on the patio. Thank you for your understanding. mbar begins in the foyer of 400 Fairview at Ground Control. A host will check you in and then a private elevator whisks you up to the 14th floor to begin your mbar experience. Enjoy drink and food specials from our Happy Hour selection! Great service, the food is also great. Love the trout. Excellent food, great service, and an amazing view. Everything we ordered was incredible- the tagliatelle and herb stew especially. The view was beautiful! The drinks were pretty good too but the food was okay. Very pricey and they only had like 5 options. The ambience was nice. 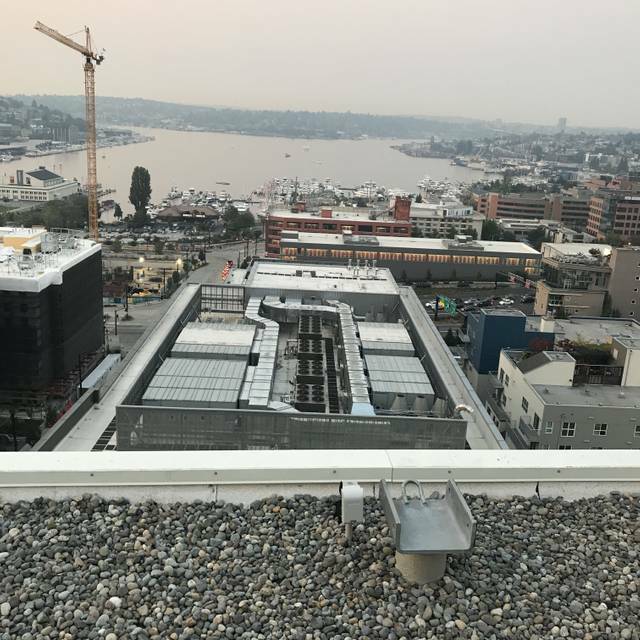 You can see all of lake Union from the rooftop. The view and ambiance are absolutely amazing! However, the food was not necessarily good! The drinks are very refreshing though. There is an elevator ride to the 14th floor and during my departure, the elevator got stuck! This was a very unnerving experience that makes me question my return to the restaurant. I had a great time! The service and atmosphere where my favorite part. Really small menu! Food was decent but barely anything to pick from! Obviously view was amazing. Good ambiance! Our server had very rude customer service. She honestly ruined our experience and we were ready to check out and she said one minute made us wait then someone else ended up helping us. 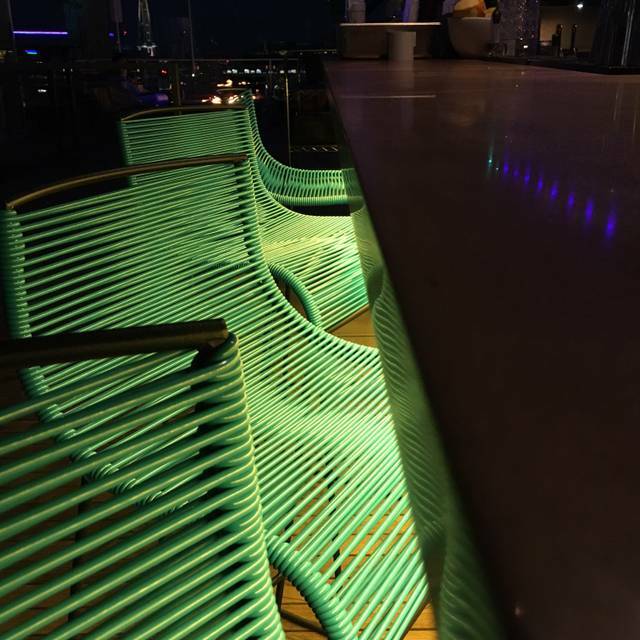 Find another rooftop bar. The service is terrible, the drinks are way overpriced and are average at best. Not to mention there was a hair in wrapped around my straw. 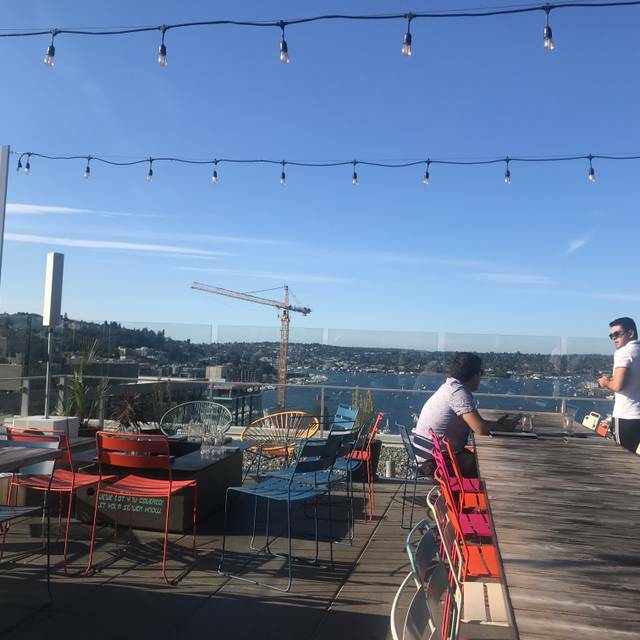 Mbar is a rip off located on a rooftop. Best ambiance for a restaurant ever. Has a CA vibe for sure. We had a reservation but decided to sit at the bar since it is a lot more fun. We later realized that the bar only serves a limited menu (very odd, I think). Bar tender was awesome; a little quiet; but made beautiful drinks. Food was interesting. I don't think the chef salts the food. The steak was $60 (which is fine); but had 0 salt on it; made it awful. The eggplant meze was awesome; the olives were great and the fried romensco was spectacular. Never got to try the real menu; will try next time. Ambiance got better once the happy hour crowd left ;). We will be back! Really unique food choices especially for the appetizers. Outside fire pits are comfortable during moderately brisk weather especially with provides blankets. Drinks and bartenders are excellent including choices on the menu as well as requested favorites with a creative flair. I would like to be able to order from the same menu as inside if I’m sitting outside. The limited food option makes it less enjoyable. Only reason I would recommend MBAR at the moment is for the view. I was there twice in 4 days, each of those times with a reservation. 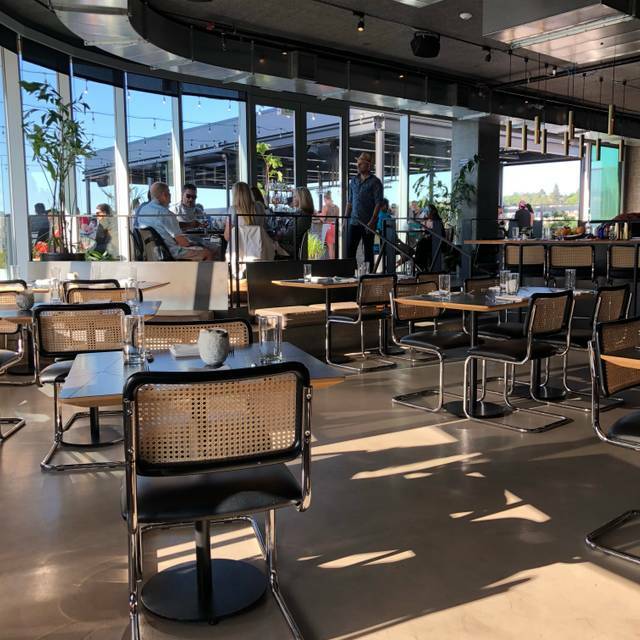 In anticipation of the nice weather, I put a reservation in online 6 days prior for outside seating, yet when I showed up there was no space so we were “temporarily” sat at the bar. After 45 minutes, I asked the maitre d’ when we would be sat in the area I had reserved and it took another 10 minutes for us to be moved outside. After that, it took another 20-30 minutes for the server to stop by with water to take our order. The food and drink selection was disappointing (although the food was good), but the service throughout the house could use a tune up. 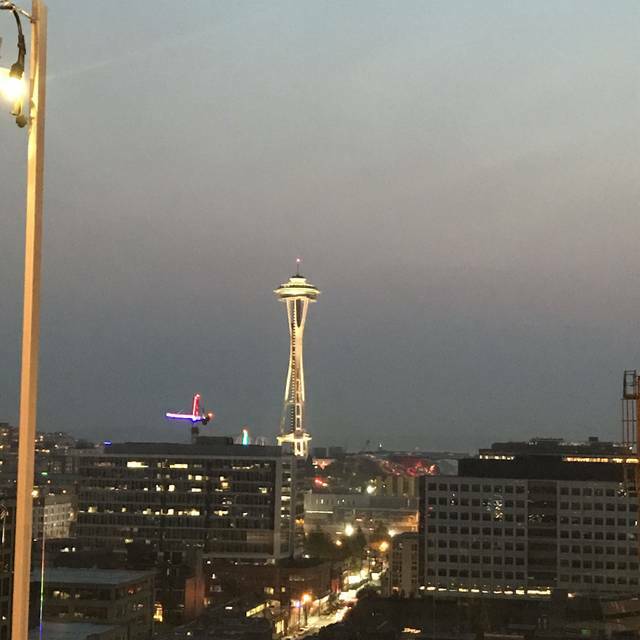 Stunning Seattle views & in a modern chic bar with very good cocktails. Be aware that everyone likes to sit on the patio next to the windows...they are obviously a hot commodity, so if available grab it! Food and drinks was amazing. Server was great however a little slow to take order. 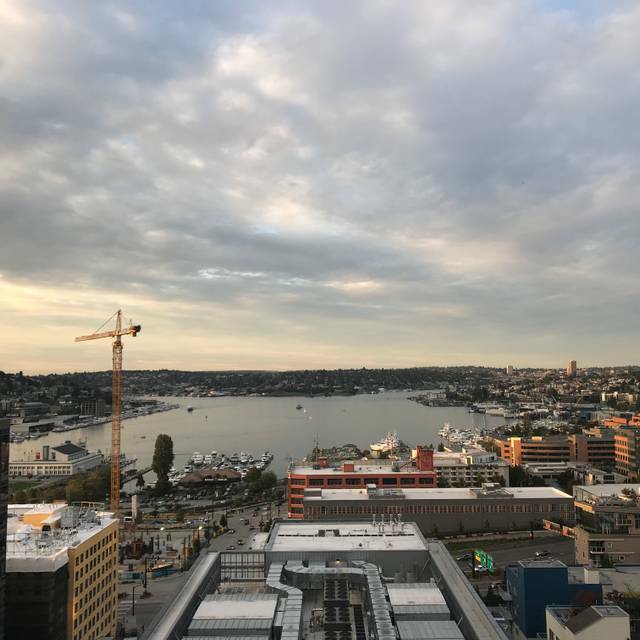 I booked mBar for the first time for a faculty recruitment dinner because I was looking for a South Lake Union area restaurant w a view, and seafood. It was a bit confusing that the sign is on the first floor, since I knew it was on the 14th floor. After taking the elevator to it, there is a long hallway to get to the restaurant. My boss said the decor was too "hip" for her initially but loved the food. Views are truly spectacular. The outdoor patio would be fun in summer, but too cold in early March. I booked a table inside and got it. Service was excellent, wine was outstanding, great recommendations for specials (scallop appetizer was spectacular), and we all selected trout, which was phenomenal with fenuguk and something creamy. Had to leave for airport, so did not have dessert, but the meal was perfect. Will definitely be back. Mbar is that restaurant hits it out of the park in all areas. Our server was terrific and provided great menu advice. The view couldn’t be better. Food was outstanding - again. Highly recommend it! The service here is so slow, but all of the waitresses were very nice and apologetic. it took an hour and a half before we got our meal. I’d go back for drinks though because the location is amazing! Service was terrible. They told us to sit anywhere then made us move because of a 15 top that never showed. The woman waiting on us didn’t seem to have a grasp on timing. When we reseated they wanted us to sit at a tiny table seemingly the size of a 1 or 2 top. We asked if we could have the larger square table. There was no excuse me, I’m sorry this is for another table of 15. It was just you’ll have to move by wires jaw shut guy. We reset ourselves and she asked if we wanted to Re-order drinks. My friend said we’d like to order something to eat. She brought us 1 menu for 3. Came back and asked us what we wanted. I said do you have more menus? She said oh yes and brought back 2 more , set them in front of me. She walked by a few times as she sat other people. Finally we ordered, which took a while, she brought us 3 sets of silverware and placed them in front of me to pass out. Every time the woman walked by me, her coat kept snagging my sweater and trying to squeeze into a 2’ space between another patron and my friend. They just didn’t seem to have any finesse. I’ve been here several times before and it just seemed like they were in the weeds. My octopus was good, as was my friends, squash. My other friend’s large pasta dish, he said was bland and small for a large and expensive. Next time, perhaps the woman should zip up her coat so she’s not flapping patrons unknowingly as she’s clomping around the deck. It just really seemed like she was angry or irritated that we were there. We tipped her well despite the experience. We’ve all waited tables and it just seemed maybe she was having an off night. We’ll try again in the summer. Matt was absolutely amazing as our host for the evening. The trout (recommended by Matt) was AMAZING! Everyone and everything was amazing. We will come again! Loved it! The place was absolutely great. Make sure to get there when there's enough light out for you to enjoy the view. Mbar is a great place, we went on Valentines Day and it was a fixed menu, food was good and prices higher for the holiday but we prefer the regular menu offered. Still a great place and you have to accept holiday changes. Always a fun place and the staff is great!! Overall it’s good, however we ask if the waitress can help us take a photo she told us to find someone, that is a let down. Food is okay the view is great. 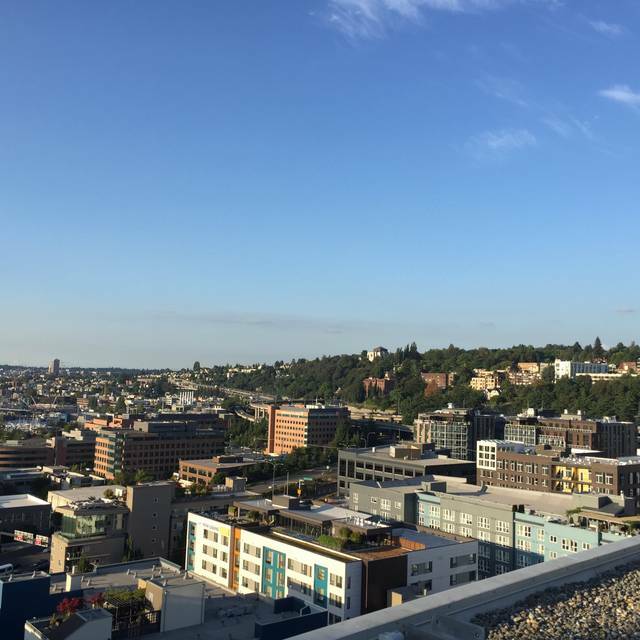 Really one of the truly spectacular dining locations and experiences in Seattle! The view, extraordinary food and attentive service are uniquely sublime. Our fav in Seattle! Overall, good food & decent drinks but only problem was the service. Super rude waitress with a lot of unnecessary attitude. mBar has amazing views, an amazing team that looked after us very well and delicious food. Went for happy hour food and drinks...totally disappointing. -the happy hour charcuterie plate was comical. 7 slices of salami, 3 pieces of buckwheat, salted butter scoop. I thought they were joking with the presentation and lack of effort and ingredients. Delicious creative and healthy food. Fabulous ambiance and service. Looking forward to coming back! As always, the staff of MBar did not disappoint. From the very attractive and attentive staff to the beautifully presented and delicious tasting food, yummmmmm (and I'm not just talking about Matt the bartender). 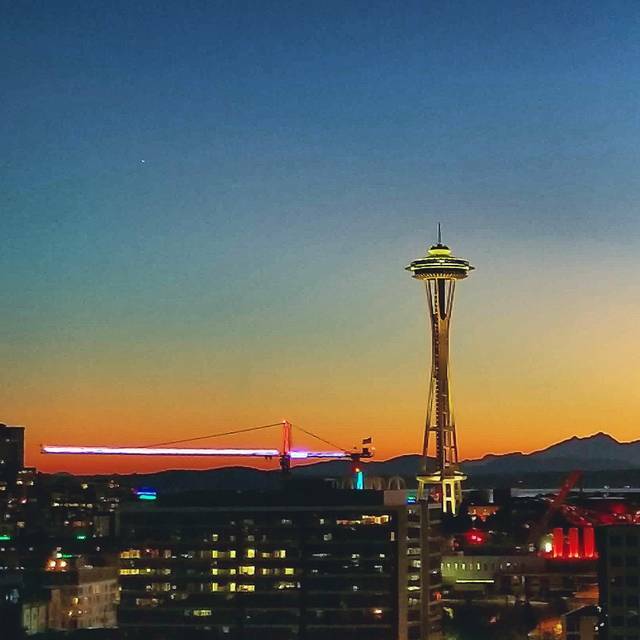 I brought my mom here for her last night in Seattle and she loved it. Thank you, MBar for always being amazing. Fantastic service and amazing views. the food was unique and delicious. Very nice location, we enjoyed everything! Orecchiette are awesome, I recommend them!